Will the audience accept this indie offering or be condemned to a cinematic life of racy potboilers? I write this fresh out of a screening of Court at a suburban theatre in Mumbai. It was surprisingly packed. Surprising, because this was a multilingual film with no stars to speak of, no fancy PR machinery at work, and claiming to portray a realistic version of the Indian courtroom (a phenomenon that has been otherwise abused by the average Bollywood potboiler). For those who are looking for ‘inhe kanoon ke hawale kar do‘ or ‘Milord, aapki adalat mein aisa kaise ho sakta hai?’ will be in for a rude shock. However, equally bizarre things are said and done in the movie. A woman is denied a hearing because of wearing a sleeveless t-shirt to court. Thirty people are produced in front of the judge because they were travelling in the handicapped compartment of a train – all free to go after a fine of Rs 500 and a gentle warning. But the focal case at hand tops it all. Narayan Kamble, a Marathi folk singer played by Vira Sathidar, is convicted on the charge of belting out a song that allegedly instigated a municipal worker to commit suicide. His advocate, Vinay Vora, (played by producer Vivek Gomber) tries his best to logically fight a case which lacks any sort of common sense. 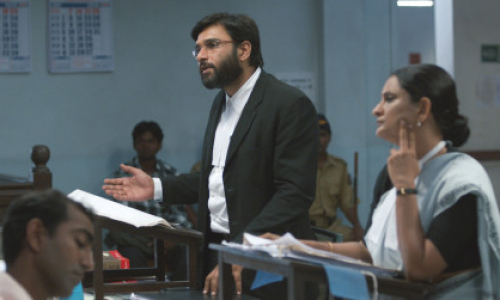 Geetanjali Kulkarni plays public prosecutor Nutan with finesse. Inciting rage, irritation and concern in the audience for her character. The one thing you don’t feel for her is pity. A job well done. Sure there were a few sluggish moments in the film. Most of the scenes outside of the courtroom seemed to drag. Although hilarious and integral to the plot, they made you crave the setting you were taken away from. Also, the film climaxed one too many times. That said, it is a brave first film by director Chaitanya Tamhane. Which brings us to the man who conceived this dark horse. 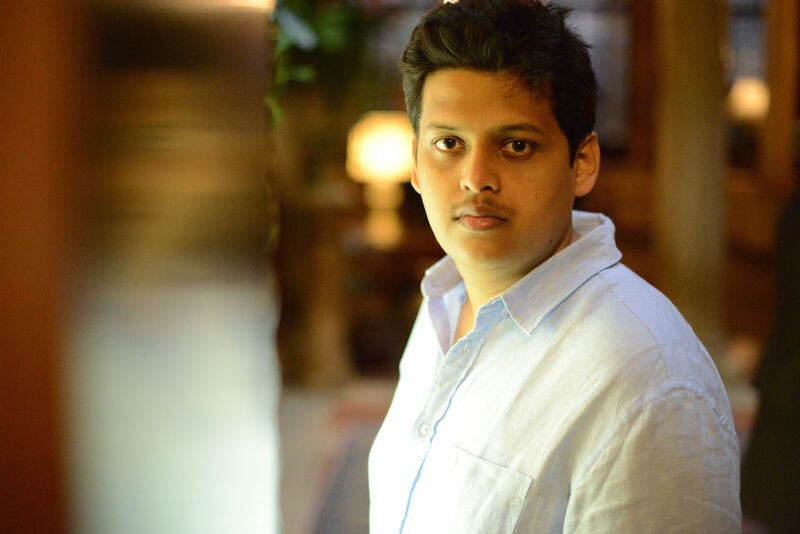 Tamhane along with friend and producer Vivek Gomber set about making a film that they knew would not be received easily by the Indian audience and in fact, the Indian film industry, would require a tedious casting and shooting schedule and most probably, would not yield the returns that a safer option would. Winning 19 awards at film festivals across the world, Court made the sort of noise that mainstream cinema, with all its shenanigans, hopes to emanate. More power to such cinema. More power to the mavericks behind such cinema, who dare to produce offbeat work. At 27, Tamhane tasted the kind of success few achieve in their first attempt. A National Award adding to your wall of trophies can both be a burden as well as huge booster. What he is worried about, though, is the nationwide release of the film that happened on April 17. Will the audience here like it as much as the film festival folk, he wonders. We met the quixotic director at his office, which was squirrelled away in an obscure part of Goregaon. Here’s what he had to say about his film. Which court did you go to? Tell us a little about the process of making Court. Did you expect to release it outside before formally releasing it in the country? Did you try to release it here before taking it abroad? As a first-timer, what was the biggest challenge while making the movie? How did you go about the process of distribution? But doesn’t a star presenter help the film? Did you face any problems in terms of censorship or political backlash? Is the Indian judiciary close to what you have depicted in your film or is this a very exaggerated version? Any anecdote you remember from the making of the film? How does it feel to receive all the adulation from national and international parties? How would you sell the film? What would you say to present it? What Point Is Q’s Garbage Trying To Make?